Did you get any of the Midwinter Reds by Minick & Simpson for Moda? Of course I did, you know me and red, but I didn't really have any plans for my bundle of reds, until now. And now I almost have too many options. 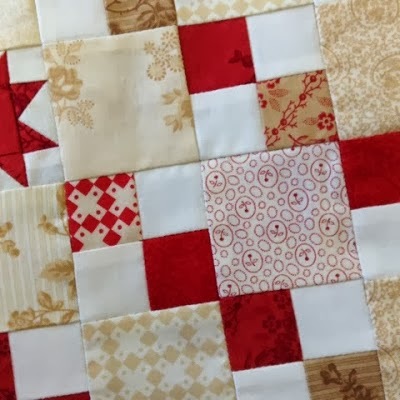 Sheryl at the Temecula Quilt Co is starting a sew along where you can really use any reds, creams and beiges, but a layer cake of Midwinter Reds would work too, that's what Sheryl is using. Right now the project is a mystery, but what she's started is amazing. Check it out! I borrowed this picture from their website, how could this quilt be anything but wonderful! I'm in! There's also going to be a new Schnibbles by Miss Rosie's Quilt Co. coming out any day now called Jersey Girl. You could use any fabric for this pattern, but I think it's hard to top the Midwinter Reds that Carrie used. Jersey Girl finishes at 36' x 36". I'm in! When Minick & Simpson introduced the Midwinter Reds fabric, they also released a few patterns made from that line, this is Nantucket. I liked Nantucket OK, and thought the quilt probably finished around 36" x 36", Schnibbles size, but it really didn't call my name or get on my To Do list. 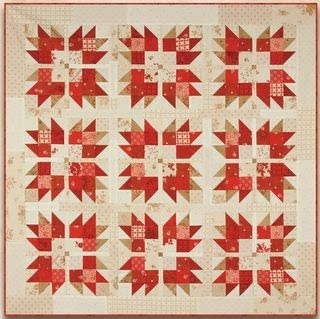 Then Sinta received a fat quarter bundle of Midwinter Reds for her birthday and decided she was going to make Nantucket and started looking for some quilters to sew along. When Sinta asked me if I was interested in making Nantucket I said no because of the size, then she told me the quilt finished at 65" x 65". For some reason that changed my whole perspective on that pattern and I said, "I'm in". So in the course of one week, I went from admiring my Midwinter Reds on my shelf to hoping I have enough to make all the things I now need to make. If you're sitting on a bundle of that fabric, and don't know what to make, come join Sinta, Lisa, Nicole and I as we work on Nantucket, or join the hundreds of quilters that will sew along with Sheryl and her mystery quilt at Temecula Quilt Co, or wait a day or two and start your own Jersey Girl sew along! Don't miss out, it's going to nothing but Midwinter Red fun! I have a few blog anniversaries that I need to celebrate, I've decided to celebrate my 4th year of blogging, (August, 2009) and my 700 post ( currently at 668) with a little Midwinter Reds giveaway. This layer cake will get you into Sheryl's sew along, make a couple of Jersey Girls ( christmas presents or decorations maybe?) or give you a start on Nantucket, just add a few of your own reds and creams and beiges. If the post office will deliver to your address you are eligible to enter, just make sure I'm able to contact you. This fabric is going fast, and Jane at Bear Country Cottons has yardage and a few precuts still in stock. She's holding one layer cake for me to buy and mail to you. Just leave a comment on this post. In your comment please tell me what season of the year is your favorite and why. Mine is fall. When I was younger I loved fall because that's when school started, new clothes, new shoes, "the smell of freshly sharpened pencils", I loved it all. Now it means the start of football season and some of the best weather we have all year. Fall is pretty hard to beat where I live. Leave your comment by end of day Sunday, November 3rd, I'll announce the winner on Monday and Jane will get your layer cake in the mail to you, probably that day, their service has always been excellent for me. Congratulations on the anniversary! Love your blog. My favorite season is spring because I love the warmth and all the wonderful green things coming back to life. Thanks for the giveaway. Congratulations on 4 years and almost 700 posts! Fall is my favorite time of year, I also love the smell of freshly sharpened pencils and the smell of black and white composition notebooks. Halloween is my favorite holiday, I had a great time even though it rained a little. Hope you have a wonderful fall and enjoy your accomplishments! YAY! Those reds are to die for! My favourite season is summer- long days of summer holidays lazing around doing ....whatever! I guess winter is my favorite (if I really have one) because of Thanksgiving and Christmas. These holidays brings my family together and this is what life is really all about. Congrats on your anniversary. Thanks for the chance to win. 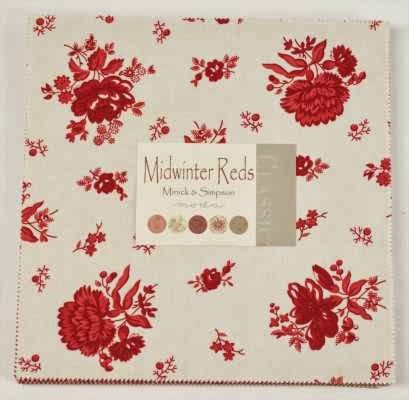 I loved Midwinters Reds from the moment I saw it first and tried to get hold of a fat quarter bundle in my neck of the woods in good old Europe but was not sucessful. (Unfortunately, this happens with a lot of the Moda lines, their representative/distributor over here doesn't seem to put too much effort in.) Of course I would support US economy by buying there but shipping costs are a killer after the last price update by USPS for flat rate envelopes. Thanks for all the efforts you put in your blog - you're always an inspiration and I look forward to every post. Congrats on your blogaversary. If I have to choose a favourite season it would be winter. I love when it's all foggy, and I'm warm inside, wrapped in a quilt, drinking hot chocolate, planning all the quilts I'm going to make. Thanks for the great giveaway, those reds are fabulous. My favorite season is fall. I love the colors, the temperatures, and the smells of fall...especially the smell of pumpkin anything as it bakes. Thanks for the chance to win some Midwinter Reds. I just love Minick and Simpson. Congrats on the blogaversary and on 700 posts and thanks for a lovely giveaway to celebrate. My favourite season is Autumn/Fall. I love the crisp mornings, the change of colours, piles of leaves, the first evening fires to sit by. All these sew alongside are tempting me and I love red. I believe Spring is the season I relish a lot. Watching the buds on our Redbud tree and Bradford Pear trees pop with fresh blooms ready to fulfill a promise of beauty and the Daffodils springing their yellow blooms is so refreshing. It feels like a new beginning of something, something that is vibrant and refreshing. I am gathering and coveting a few Midwinter Reds but not nearly enough and would LOVE to joing in on a sew-along. Can't wait for Christmastime :) I would love to join in Temeculas QAL...happy celebrations to you! My favorite season is winter. It's a chance to hibernate and do all the indoor things I love to do. My favorite season is fall-weather, leaves changing, great fishing up north, baking, sewing, Halloween decorating and walks. Love all your suggestions for Midwinter Reds- the patterns and Temcula's quilt along! Love your blog!! Football season! so guess that would be fall :) The leaves changing color, though not so spectacular this fall here, the smells of cold weather cooking, the chill in the air, starting fires again in the fireplace, knowing the time will change back to normal (this week-end yeah), every day means a day closer to the days getting longer again, the upcoming holidays, the abundance of fabric choices in my favorite colors for quilts, and did I say football, though my team not too spectacular again this season! Thanks for the chance at this wonderful line. I have wanted it since I saw the first display. And thanks for your wonderful blog. You are my idol. Spring is my favorite season. Where I live winter is short, some even call it prespring because the number of freeze nights is relatively low. We even have daffodils in February! I await the soil temp coming up to 50 degrees so I can plant tomatoes. Seriously I'm so grateful for your blog and others that have provided so much valuable information. I have learned a great deal and look forward to your posts. Thank you. My favorite season is Fall because I love the colors and the break in the weather after the hot Summer days. It is also the beginning of the holiday season. So happy that I live in a 4 season climate - would hate to miss out on any one of them, but perhaps I always looked forward to summer the most. Couldn't wait for school to end + then have a stretch of long lazy hot days ahead of me, but then as a teacher, I would! Love, love, love your generous giveaway. That range is sooo beautiful. I like Fall best. I like getting ready for holidays and the anticipation of it all. ?Love college football and the fall colors are my favorite. You have big plans for this fabric. I don't have a single scrap of it. Thanks for the chance to win the layer cake. I do love it. have a great weekend. My favorite season is summer! I love having a veggie garden, flowers in bloom, camping & lazy days. I'd also love to bite into that stack of Mid winter reds!!! Fall is my favorite time of the year too. I have more fall quilts than any other season. I think I'm just drawn to all the color. My favorite season is the one I am in at the time! All four in Iowa are different so it gives everyone a chance to regroup, decorate and enjoy what each season brings. I love them all...and I love Midwinter Red!!!!!!!!! Hope I win...your patterns have peaked my interest! Happy blogiversary!! My favorite season is spring, mostly because I love the bloom of flowers and seeing all the color Spring generates. Thanks so much for the giveaway. I think Midwinter Red is a winner! My favorite season is spring. I love the daffodils and tulips. My favorite season is spring. I love it when everything is blooming and I know winter is over. I love fall too. Love the colors, the cooler temps, the anticipation of the holidays. Fall, hands down. I love the feel of fall, especially the warm sun and all the colors of harvest in the fields. Except this year, we havent had hardly any fall sun and still are a long ways from being done harvest. We need that fall sun up here! Have a great weekend. So many wonderful choices for the gorgeous Midwinter Reds! I actually love the Nantucket pattern the best. My favorite season by far is fall! I wait all summer long for the heat to go away, and the cool, crisp, cozy, invigorating fall weather to arrive. Also, all the gorgeous fall colors here in NH just happen to be my favorite colors. Happy blogiversary!!! I love Fall, the beautiful colors, lower humidity, the start of the slower pace. I also love Red! You can reach me at quiltlady2010@hotmail.com. Thanks! I love all four seasons. I love the change from one to the other. Makes life interesting. That's why I couldn't live somewhere that has no winter snow, you're missing that season completely. Call me crazy! Congratulations on 4 years of blogging! Have been tempted to try it but not computer sauve enough. Love Scnibbles, look up the definition and just loved it. Keep up the fun! Laura V.
I love those MidWinter Reds. I've been buying fat quarters of them whenever I see them in the store. As for my favorite season, it used to be fall as well. But now that I have some health issues aggravated by colder weather, I've become a big fan of the summer months. Really though, I love seeing the seasons change from one to another. It always gives me something to look forward to! What a wonderful giveaway. My favorite season has to be the lazy days of summer. Well, they're never too lazy, but filled with vacations and warm sunny days and plenty of things to do outside. Congratulations on your blog anniversary. Ooooh, Thelma, I don't know what to make! Such a great collection! My favorite season is Spring, I love the freshness and the renewal aspect. Thanks for the chance to win, I really like Nantucket! Fall. All because of the colors. Love the red! My favorite season is spring. I've always lived in a place with real winters and by March I need the warmer weather, brighter colors, fresh flowers. May is probably my favorite month. I've had my eye on Mid Winter Reds and all three projects are very tempting! Fall is by far the best! Here in San Diego we get such clear days and such beautiful blue sky's! Like you I couldn't resist the Mid-winter Reds fabric and bought a charm pack to make a table runner but now, I may have to buy another if Jersey Girl uses two charm packs. Carrie's Schnibbles are just the right size for "quick" projects. My favorite season is Spring--my birthday, new shoots seen in the garden and baseball! Thanks for the opportunity to win the layer cake, Thelma. Definitely fall! I have come so close to acquiring some of Midwinter Red, I hope this is my lucky weekend! I love the midwinter red collection. I Procrastinated in buying the precuts at my LQS and mised out on them. I did by some of the yardage and I'm on the look for a fat quarter bundle. I'll check out your friends website! I love Christmas, it reminds me of my Grandmother, who I was extremely close to and lost when I was 14. And red was her favorite color and of course it's MINE too! Would love to win! Fall is my favorite - the very hot summer is over, the nice cooling weather for fall gardens, Thanksgiving and starting to think about Christmas. Midwinter Reds are gorgeous!! Summer is my favorite season! Outdoor movies by the pool---barbecues---kids out of school---love, love, love!!!!!!! Any season where the temperature will drop below 80 degrees in Houston is my favorite season. Not there yet - maybe in a couple of weeks. I will be joining the Nantucket sew along and was also thinking of doing the Temecula project too. I've already got my FQ bundle and just a few other precuts, so I'm ready. I just wanted to comment! I love fall the best. All the business of summer has passed and we can settle down and get some sewing done. I'm still in flux about sewing this year, however, as I can't get to my sewing supplies in the basement cause it's a mess from the "great flood of '13!" Love Midwinter Reds and would love to join the sew-along. I love the fall. All the hard work of summer gardening is over and the harvesting done. You can sit back and enjoy the fruits of your labor. Grab a cup of coffee, a sweater and a good book, sit on the back porch swing and just enjoy doing nothing. That's the life! Has it really been four years? Congratulations. I've enjoyed all your posts. The sew along is going to be so much fun. I'm going to enjoy watching your progress :-) I'm hoping you'll share lots of pictures. My favorite season is Spring - new leaves are starting to sprout on trees, flowers are starting to ease out of the ground and everything feels fresh. I would love to win this layer cake. Keeping my fingers crossed. Those reds are beautiful .........I love the spring the most, everything seems so new. I love Fall the most; a time for reflection and preparation for the winter. Fall is my favorite season - partly because that is when you start wanting a quilt to cuddle under. Spring would be my second - waiting to get my hands dirty planting something. I plan to do the Temecula QAL and already practiced one block. Thanks for more inspiring ideas and the chance for some cake too! Congratulations on the Blog Anniversary. I have it bookmarked on my computer and phone. I have to say I like something about all the seasons. Fall is my favorite time of year ! Fall colors, pumpkins , cool nights with the fire place going ! Congrats on your Blog anniversary Thelma ! Count me in!! I also love reds...thanks for the chance to win some. Autumn is my favorite time of the year, also. Love the colors, weather and smells of the season. I'm usually ready for each season when it starts - but I would have to say fall is probably my favorite. I love the colors, the decorations, the feel of school starting, Halloween, Thanksgiving, soups, warmer clothes, leaves changing colors, you really can't beat it! This year I have really noticed all the beautiful colors of the trees and leaves as they were changing. Pointing everything out to my kids so they will appreciate the beauty. Love your You've got mail pencil quote! Great giveaway. I love this line too - can't wait to see your project list come to life. I love the fall as well. We live in the desert so the cooler weather is sooo welcome but I really love the whole changing of the season. The colors of the falling leaves, the smells, the comfort foods, snuggling I could go on and on :) Love you r blog !! OH THELMA,THIS IS THE MOST GORGEOUS GIVEAWAY! I TOO, LOVE AUTUMN, BRIGHT FOLIAGE,CARAMEL APPLES,LEAD PENCIL-SMELL>LOL! Fall is my favorite season as well! I love the colors, the cooler weather, the fallen leaves. When I was young, fall brought the smell of drying corn from the town's elevator. I also associate corduroy and sweaters with the fall...it was 'what to wear' when I was in high school! That fabric is beautiful and nearly sold out where I live. I love fall, but have to say that I like spring better because that means summer is coming...fall - winter is just around the corner, brrr. Thanks! Perfect fabric for this time of year and all great projects. Fall is my second favorite season, simply because I love the crisp air and watching the trees turn. Spring would be my favorite season of all. Everything is green, color is coming back and the days are getting longer. There is just such a newness to everything, a fresh start. Congrats on your upcoming milestones. I have enjoyed your blog for quite I a while. My favorite time is Christmas (not winter necessarily, but Christmas!) I've always lived in warm weather, so Christmas is usually perfect 60 degree, sunny, and clear. My birthday is mid December, so my family would always put up the tree on my birthday which I still do to this day! Hey, I know where your quote came from "the smell of freshly sharpened pencils". One of your favorite movies (also one of my favorite) *You've Got Mail*. I love fall because of the beautiful colored leaves, the apples, and the pumpkins. This is a gorgeous group of fabrics. Thanks for the chance to win it. Oh My Goodness, I absolutely love this fabric! The paint in my living room is red and this goes perfectly! This is a "have to have it" fabric. Winter is my favorite season because the heat is GONE, the bugs & flies are GONE, the kids are in school, and there is no road construction with snow on the ground. Whew! I love spring. The days start getting longer, trees and plants come to life, and there's the prospect of months of good weather ahead. Of course, as I live in the UK that doesn't often actually happen, but the prospect is there! I love Fall for the changing colors, but honestly am joyous first days of Spring for warmth so I can defrost from Winter! I'm on the hunt for a FQ bundle...any ideas where I can score? Fall is my favorite. I love crunching through leaves and the crisp scent of the season. I have to admit, though, that I also love the first snowfall of winter and walking in the hush that snow brings to the street. What a fantastic gift to celebrate! I love fall the best...the colours, the smells, the lower temperatures... I love it all! I am doing the Temecula mystery and I am so excited about i! I love Spring, which is beautiful in NC. I also love your blog! That fabric is gorgeous....I love anything red and would LOVE to have that layer cake ! You're right - fall is hard to beat. It's always been my favourite time of the year. For me coloured leaves and crispy days are the best. I think fall might be everyone's favorite time of year I know it certainly is mine. The weather is perfect for my red headed self - not too cold and not hot, the light has that crisp quality that makes all the colors look so fresh and the food is all comfort food. It's all deliciousness. I like fall, too, especially in New Hampshire. This Iowa girl thinks the foliage there is spectacular! Congratulations on your blog anniversary. I love fall. I love the cooler temperatures and the colorful leaves, wearing sweaters, pumpkin and apples, leaves crunching under my feet, wearing sweaters, etc. oh...I love this fabric and want it ,,,,,,I already know that I will do the "Jersey Girl" pattern and this is the best for that pattern. Now there seems to be more than one pattern I could use it for ...crossing my fingers, and toes and whatever! :)))) Can't wait to see your start Thelma and which one is first for you??? My favorite season is Spring. Everything is just starting to grow. It means new colors, new smells, ice off the lakes, going outside without a jacket. To me, it just means life, like giving birth. Love the fabric! congratulations on your upcoming anniversaries! i really enjoy reading your blog :-) my favorite is winter--we don't have snow here in california bay area but i do like the rain & gloom--sewing weather! I love Spring! I always look forward to everything greening up and flowers starting to bloom after a dreary winter. I planted a ton of bulbs this fall and can't wait to see them bloom next year! Thanks so much for the nice giveaway. I love that fabric! ~Fall is my favorite~ pumpkin pie, fabulous colors of the changing leaves, and cooler weather. Fall puts me in the mood to stitch up some primitive stitchery. Love the Temecula Quilt Co's sew along. Thanks for the chance at your generous giveaway. Fall is my favorite season of the year. I love the leaves that change colors, the smells of fall ~ pumpkin, spiced cider, McIntosh apples; fall clothes ~ sweaters, boots and turtlenecks. But most of all, I love college football!!! Nothing makes me happier than to be able to sit and watch college football on Saturday! Thank you for the chance to win this layer cake! And congrats on your 4 year anniversary and 700th post!!! You might need to buy some more of the Midwinter Reds just to have backup... who knows, you might find another pattern to be "in" on! Happy blogavirsery! You are always an inspiration Thelma! This is a fun way to start the next season of sewing! I love fal! It's the colors that do it for me. But I also love Midwinter Reds and am happy to have the chance to win some. Bundle and a Hamptons kit in Midwinter Reds! Hamptons is an It's Sew Emma pattern. 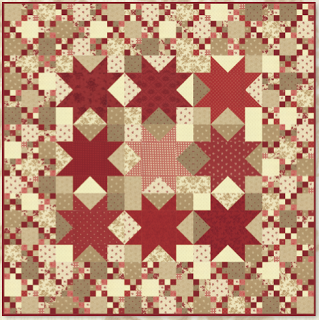 Hopefully I can get 2 quilts from the FQ Bundle! I too love fall with the explosion of color in the deciduous trees. Raking the leaves as they come down and watching my grandchildren run and jump in the piles, so much laughter, so much fun! The smell of wood fires as my neighbors start to heat their homes evoke childhood memories of my grandmother's kitchen woodstove. Fall brings baking binges are welcomed by family and friends after the summer abstinence when it has been too hot to use the oven. Fall is also the time of year I can once again hoop a quilt and let it spill across my lap while I hand quilt; cozy, cozy, cozy. I too love reds and the Midwinter Reds line is a special treat I look forward to, patterns are spinning in my head!! Great idea! I love Spring, it's a great time to refresh the house, all of your sewing, including emerging from Winter to get back on the treadmill of life. I've been wanting to do a red quilt for years, this just may motivate to finish something relatively quickly! Thankyou for the chance to win this great range. I love summer, but not because of the weather...I am a teacher so summer means freedom to quilt for me! I like spring the best. After a long, cold & dreary winter the spring flowers really make everything happy ! I would love to win the red collection of fabric ! I've always lived Fall best. I have a couple charm packs of Midwinter Reds and haven't decided what to make with them yet, maybe Jersey Girl! Congrats on 4 years of great posts! Spring is my favorite time. Love seeing all the wildflowers in bloom, then the bulbs and spring flowers, plus the flowering trees. It is just such a pretty time of the years. Midwinter Reds is such a great collection! Thanks for the chance to win it! Congrats on 4 years. I love spring. Life comes back, & so does the warm weather. Fall is my favorite as well. This fabric is gorgeous. Congratulations! Red and cream, such a great combination. Congrats on your Blogaversary, so glad out paths have crossed. Congratulations on 4 years... I really enjoy your blog! I live in lake country so summer is my favorite season. Fall has always been my favorite. I love the coolness in the air, the brilliant color of fall leaves, Halloween and then throw my birthday in the middle of October to top it off. Spring is definitely my favorite! I love seeing nature coming back to life, the trees starting to green up, the flowers beginning to bloom and the days getting longer. The warmer weather also means I feel better and I can get more quilting done. Here's to many more blog posts! My favourite season has to be the one about to come, for I love the change from one to another. My favorite season is summer. I love having a big vegetable garden with fresh produce. It's a lot of work but really worth it. Those midwinter reds are wonderful. I definitely need some. I would have to agree with you..Fall is the best season..cool crisp air..crisp apples, crunchy leaves under foot, leaves of every color..even the rain is beautiful, the rain darkens the tree branches and brings out the gorgeous leaf colors. Pumpkins..oh I could go on and on..apple crisp, cider, hay rides, long walks in the woods. Can't beat Fall. oh wow! that's a hard question because I love fall and winter. I guess fall is my absolute favorite because the changing colors outside are amazing! I love the dropping temps and just the all around calmness of the season. Thanks for the opportunity to win those fabulous fabrics. I really enjoy all the seasons, but Winter is my favourite. I love a good snow storm. I love a fresh field of snow, and icicles hanging from the eaves. I love to send more time inside quilting. I was a winter baby so that means birthday gifts! So for me, what's not to love about winter? Oh yeah I love Mid Winter Reds too! Definitely fall! I love the show that nature puts on with all the colors. I love the crispness in the air and being able to open the windows again after the heat of summer. Midwinter Reds is a fabulous collection--I'd love to do something with them. Thanx for the chance and congrats on your blogoversary. Thank you for a wonderful give away. I love Spring. Everything is fresh and new with lots of warmth and sunshine. It really lifts my spirits! Hi Thelma. Spring Spring Spring! I just love the time of the year when buds are pushing out of the ground and everything seems alive with promise. Thanks for the chance to win. There are so many great ideas out there for Midwinter Reds that it would be hard to decide on one! I am planning to do the Sew along with Temecula Quilt Co and don't have my fabric yet for it. I would love to win! Winter is my favorite time of year because it is quilting season for me, giving me more time to sew. Fall is my favorite time of the year. Love the colors and the thought of snuggling time beginning. Great time to stay home and quilt and knit. Congratulations on 4 years! The mid winter reds are lovely. My favorite season is Winter. I love cuddling under a warm quilt, sipping hot chocolate and reading a good book. Too bad winter is rather short in Florida where I reside. Happy quilting. Congratulations on all of your milestones. The Midwinter reds are lovely, they ooze warmth and happiness. My favourite season is Winter. It is so nice to be able to snuggle down in bed with the weight and warmth of extra quilts. I love the rain and snow if we have any as it freshens everything, and then knowing that from the freshness comes the season of new life and beginnings. I love fall the best, always have. I like the colors, the character of the light, the freshness of the air, the cool mornings. I also loved starting school again when I was a kid. Nothing like the first day of school (and the last!). Thanks! I love fall too! Less yardwork to do = more quilting time! I forgot to add that the heightened sense of smell seems best in fall and I love to hike in these Adirondack woods. Lucky Me!!! 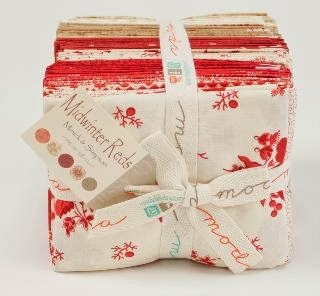 This Midwinter Reds bundle ha as been calling my name since its release! I would be thrilled to win! My favorite season is spring ...It's like everything is new and fresh again, flowers are blooming, and grass is being cut - greatest smell ever, and even the air smells better. What a treat! I love the Nantucket pattern, and made it in reds for a dear friend, but I think my little TX home could use a touch of Nantucket as well, especially with my crush on Midwinter! My favorite season is Spring in TX-hello bluebonnets! Love this fabric line, but my fabric budget is shot. It would be wonderful to win this so I could follow along with the Temecula mystery. I like Spring the best. Winter is over, and the earth is waking up again. Thanks for the chance at your giveaway. I love fall best, too, for all the same reasons and because it has always been a time that seems to make me feel more alive! Thanks for the chance at the layer cake. I'm in love with Midwinter Reds! I used to love spring, all the flowers, the promise of summer. Daffodils, and Tulips were my favorite flowers. But then I moved to Michigan, and I love fall. All the colors. I love seeing the reds, oranges, yellows, and purples which explode along the roadsides. I love at most spring time but the fall with all colors is beautiful. Summer is the time of vacation,many houers are living in the garden. And winter when the snow is coming is nice too. My favorite season is Autumn. I just love the beautiful colors of the leaves. They are just breathe taking, can't see how anyone could manufacture those colors. when the sun is shining and the sky is blue it just takes my breathe away. Hard to drive on the highway with all of the beautiful trees. Use to love the smells of racked leaves burning by the curb. now, those where the good old days! Oh Thelma, I love fall and I love Midwinter Reds. Perhaps I could make these two a "winning combination" ;-). I hope so. By the way, YOU are an inspiration. Fall has always been my favorite season for the very same reasons you gave. Being an only child, summer was SO boring--even with summer school! I also love the fresh smell and the light because of the angle of the sun. Congratulations on your soon-to-be 700th blog post! I LOVE your blog!! awesome giveaway, I love the reds!!!! My favorite season is fall, here in Texas they are mild and the best time of year to be outside. I love spring, when all the flowers bloom. I love the reds in that bundle and would love to do the quilt a long!!! My favorite season is spring.\, when the flowers start to bloom and the birds are making nests and singing. I love this line of fabric and would love to win so I could sew along with you. I have never sewed with a layer cake before. Thank you for sharing. I have to say fall right now because of the gorgeous colors. I think there is something I love about each season. Love winter too because of being snug and warm in the house. I could go on but I'll stop for now. Love the midwinter reds. Thanks for the chance! I love the Fall...the food and colors are certainly favorites for me. There's nothing better than the smell of fresh applesauce! So glad I found your blog! I, too, love fall. The beautiful color, the crunch of leaves under foot, the cool, crisp air, the sounds of the nearby high school band practicing after school, and best of all, the knowledge that now that I am retired, I don't have to get back to the lesson plans and grading papers - I can just quilt to my heart's content. Yay! I just found out i need to make a quilt with RED for an upcoming wedding couple! Perfect timing! My favorite season is right now - I absolutely love Fall! There are lots of reasons - the new school year - just makes me think of new beginnings, the cool, crisp air, the holidays are coming and I love the colors! My favorite season is fall. I love the colors, smells and cooler weather. My favorite season would be summer. I love it when the kids are home from school and the house is filled with lots and lots of people. My kids friends are always welcome and come to visit, swim and hang out. Love the easiness of summer without all the pressures of school, or the winter holidays. Fall is my favorite season. I love the turning of the leaves which in my area of the country are these beautiful colors of gold. Also I love the cooler temps. That is some very beautiful red and white fabric! Thanks for the chance to win some! My favorite season is spring because of the fresh and new growth of flowers, trees, grass and crops. We've lived on a farm for many years so it just has to be my favorite season because everything grows new! I love Fall. I love the more moderate temperatures, the beautiful golden sunlight, the plentiful apples in our local orchards, and I love my pumpkins I grow every year. I grow a variety of sizes and colors and love to decorate with them - inside and out. Funny I have been waffling on buying Midwinter Reds. I keep telling myself to use the fabric I have....but if I won fabric that would be amazing. I think I would like to do the Jersey Girl or the mystery. So many decisions. I am lucky to live somewhere with four very distinct seasons and I honestly can't choose a favorite--there is so much I love about each one! Summer is great because I get to spend time doing fun things with my (7) kids, Fall is fun because they go back to school just in time to preserve my sanity and their friendships with each other :), Winter is wonderful for sledding and hot chocolate and marathon reading sessions, and the first day it's warm enough to go to the park in the Spring is like winning the lottery. I feel blessed to live in such an amazing world and to learn to appreciate it more through the eyes of a child(ren)! Thanks for your delightful blog, Thelma. It always uplifts and motivates me! Summer is my favorite! I love my job as a teacher, but who couldn't look forward to a summer off? I also celebrate a July b-day and live for our beach vacation every year. Recently I have enjoyed sewing some modern quilts. Those bright summer fabrics set off by clean white background....so fun to work with in the summertime. Linda W.
Some how I missed the fat quarter bundle of this. I thought our local shop (hr away) was getting them so waited, nadda, so I will be on the hunt again. I did make the original Nantucket, and love it so much. Yes, it's much bigger than the 36". I just love the little beach pails that are sprinkled in that quilt! My favorite season is SPRING!!!! I am fascinated by seeing everything come to life after all the dark dreary winter. The fact that my birthday comes that time of years has NOTHING to do with it - hahaha!! There's nothing like a bright spring day with the birds singing while others are drunk on the berries - just makes my day!! I love red!!! I love Fall!! Love the weather and the colors and EVERYTHING pumpkin! I have my share of Minick and Simpson fabrics in my stash, too. Nantucket would be my choice and I think I have plenty of reds to add to the layer cake to sew a wonderful quilt. Congrats on your milestones. Yours is the first blog I read. Thanks for the chance. I can't pick a season - although the lazy dad of summer are hard to beat. I also know I love Nantucket... I'm in! Happy anniversary! I love fall because the weather is so perfect, warm days and cool nights. I also love all the fall/winter soups, stew, and casseroles that are so yummy! If only it would last longer!! I love the Nantucket pattern and would love to win the layer cake. Congratulations and thanks for a great giveaway! I love winter (as long as I don't have to get out in the snow too much - LOL) I love the holiday season and all the fun times with family. I also LOVE red - it is my favorite color and know this layer cake would make a beautiful quilt. Thanks so much for the chance and congratulations on your accomplishments! I love spring the best. Flowers popping up, trees in bloom, green grass......love it. I am a Fall lover.The color of the changing leaves. The sound of our grandkids jumping in the leaves and their laughter of us finding them buried under all the leaves. I love fall, football, and the anticipation of the holiday season. And I love the Midwinter collection for each of these patterns. Your blog is the perfect blend of inspiration and helpful hints. Thank you so much for sharing yourself with us. Autumn used to be my favorite season until it started snowing in October! I guess it probably still is--love the colors and scents and cozy fall cooking too. I've resisted buying M&S Midwinter Reds since I broke the budget on half yards of their Indygo Crossing line, so thanks for the chance to win some and congrats on the blogging milestones! Beautiful fabric and quilts. My fav season is summer because I like to swim. But the colors of fall are just amazing. I love watching individual leaves float down to the ground. I love those Midwinter Reds. And all three of the quilts you're "in" for are fabulous. You'll have a Midwinter Reds bonanza when you're done. And knowing how you work fast and steady through your projects, we can all look forward to seeing great progress soon! My favorite season is spring. The wonderful light, the fresh soft breezes, the flowers, the return of green with grass and leaves ... and the promise of fresh-grown local food, beginning with asparagus. And I love Midwinter Reds! I have that on my wishlist! Thanks for the chance to win some! Fall. Warm colors, nights that call for a sweater, a cup of coffee, spicy tea, or hot spiced cider. Sunlight is more golden and softer. And I love reds so I hope I'm not too late to enter.